It’s May in the Okanagan! Okanagan summers are made for getting out of the house, for enjoying the sunlight, for feeling the lake breeze cooling your skin, for BBQ parties and family reunions, for stretching out and relaxing with a good book while working on your tan. Okanagan summers are made for enjoying life outdoors. Visit us at the Canadian Home Builders' Association South Okanagan Home & Renovation Show at the Penticton Trade & Convention Centre March 5 & 6, 2016. Show times are 10am to 5pm Saturday and 10am to 4pm Sunday. We're back again for the Real Home Show at the Kelowna Curling Club and after the huge respond regarding our last year’s gazebo give a way, we are doing it again! 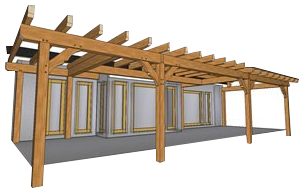 Trusses are used to span from one side of the room to the other, without touching the floor. They can create a spectacular and unique look in your great room, kitchen, patio etc.